Getting a visa to visit Iran can be slow and sometimes disappointing, but most applicants do get one Iran tourist Vizum / visa within two weeks and, once they’ve been to Iran, think the hassle was worth it. This article will guide you through the options, though it’s worth checking with the relevant consulate as rules do change with unnerving regularity. All foreign nationals willing to travel to Iran are required to apply for visa to visit Iran for purpose of sightseeing and or visiting family members or friends. However, the process is still easy despite being difficult to apply for a visa in same cases and or for some o the nationals such as American, British and or Canadian. Who needs an Iranian tourist visa? Do i need a visa to enter to Iran? A question you may ask yourself when you start planning your trip. Passport-holders from half-a-dozen countries (Bosnia & Hercegovina, Macedonia, Saudi Arabia, Singapore, Slovenia and Turkey) get a three-month tourist visa on arrival. Everyone else needs to arrange a visa in advance or take a risk on getting a 30-day visa on arrival at an airport. American citizens are welcome, but need to pre-arrange a tour or private guide in Iran, or be sponsored by a friend or relative in Iran who will take legal responsibility for them. Israeli passport holders, and anyone with an Israeli stamp in their passport, will not get a visa. You need to change your passport if you’ve been to Israel and apply for a visa to enter to Iran without an Israeli stamp in your passport. Which Iranian visa type do I need? ⇒ Tourist visa: issued for up to 30 days and extendable. Must be obtained before coming to Iran and valid to enter for 90 days from the issue date. This is the safest option. ⇒ Tourist visa on arrival (VOA): issued for 30 days on arrival at any international airport. Convenient but relatively risky as you might be denied entry. ⇒ Transit visa: issued for five to seven days. You must enter and exit via different countries, and have a visa or a ticket to an onward country. Can be obtained in one or two days and, critically, no authorisation number is required. Not available to US passport holders. Citizens of following countries are not granted to get a visa on arrival: USA, UK, Canada, Colombia, Somalia, Bangladesh, Jordan, Iraq, Afghanistan, Pakistan and India. Other than transit visas, all visa applicants must be ‘approved’ by the Ministry of Foreign Affairs in Tehran. This includes those seeking a visa on arrival, who can be approved either in advance or, with a longer wait, on arrival. If you’re approved, the MFA sends an authorisation number to the consulate or airport, which takes your application form, passport photos and fee and issues the visa. Fees vary depending on your country of origin; see the relevant embassy website or contact us. Avoid the No Ruz (Iranian New Year) holiday period – March 20 to April 3 – when all bureaucracy shuts down. Submit before 8 March to be safe. How to start with applying for a tourist visa to Iran? How do I do it? Well, basically, you need to decide which visa type you want and whether you’ll try to get the visa yourself, or apply online to smooth the process. Going directly through a consulate saves an agency fee but often takes longer and has a much greater chance of rejection (many consulates won’t even accept an application without an authorisation number). In theory, you download the Iran visa application form; take or send it with your passport, photos, money and proof of your travel insurance to the embassy, which then sends your details to Tehran for approval. If you’re lucky, a week or two later your passport (hopefully with a visa) will come back. Exceptions abound. In rare cases this method can take just a few days. However there have been many cases where weeks after submission the consul has directed applicants to a visa agency to get the authorisation number. visa fees are vary, we at IRTouring, charge for US$ 45 to get you an authorization / visa approval number. In most cases you fill out an electronic form with details of your itinerary and where you’d like to collect your visa, attach digital copies of photo and passport, and then, we will submit it to the MFA in Tehran. The MFA claims it takes between five and 10 working days to assess the application (unless you’re British or American, when its slower, more costly and more arduous). But plenty of applications take longer or require some clarification. There is no refund if your application fails, but take comfort that only about 2% are rejected if you apply online Visa to Iran through IRTouring. Once the authorisation number is received, we will forward it to you and your nominated Iranian embassy/consulate. You then need to refer to the embassy / consulate, and in most consulates the visa is issued in a day or two or right on the spot – in Canberra it took us 25 minutes. If you’re organising an Iran tour with us, you’ll find us will probably organise the authorisation number as part of your trip service. Any Iranian can sponsor your application, so if you know an Iranian in Iran and they are prepared to go through the process for you, you can save yourself a few euros. Most travellers use the travel agency that is arranging their trip or a specialist visa agency that has a working relationship with the MFA. Easier / Better / Faster / More Reliable…. Remember that using, and paying, a tour operator such as IRTouring is not a guarantee of getting a visa, and you won’t get your money back if your visa is not issued for any reason. To avoid most problems, start the process early. Iran issues 30-day Iran tourist visas on arrival to people from about 65 countries, including most European, ASEAN, Gulf Arab and Central Asian countries, several South American countries, Australia, China, Japan, New Zealand and South Korea. Notable absentees are Britain, Canadian and the US. Applicants must have an onward air ticket. In theory VOAs are available at all international airports to visitors with an Iranian sponsor, such as a travel agency, visa agency or hotel manager (budget hotels don’t seem to count). And some people report getting one with only the name of a hotel in Tehran / We can not confirm this at all. In practice, however, this service is risky. We’ve heard from numerous people who have been sent back when their expected visa did not materialise, even though they seemed to meet all the requirements. 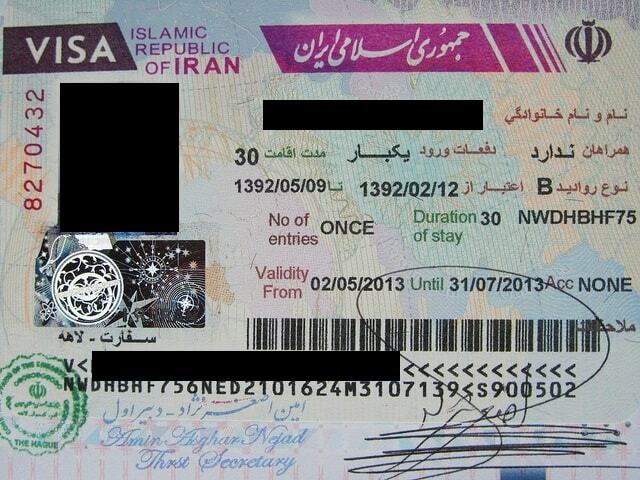 Extensions to these Iran visas are also harder, with another 15 days usually the maximum if any is given. Extending your visa while in Iran isn’t hard if you take the variables into account. Refer to the passport and visa office in each city, usually Tehran, Esfahan, Yazd and Shiraz are the best places to extend your existing visa, fill a simple form, transfer a small amount to the bank and get your passport pick up in same day with your 15 day expansion. ⇒ That if your application is rejected once, you will never be able to get a visa. It probably will stop you getting a visa on arrival, but trying another embassy or apply visa online will work. ⇒ That visa agencies will always be able to get you an approval number in 3-5 days. They are subject to the the rules of the ministry too. ⇒ Equally, don’t believe you’ve been conned if your visa doesn’t turn up in time or is rejected. There’s nothing to be gained for agencies by slowing the process or just taking your money without performing the service. Please provide us with the accurate information as shown in your passport , any wrong information will cause the visa failure and the re-apply.